In last night’s letter I decided to look at other times where a 3-day pullback was coming off a 50-day high and was strong enough to put SPY below its 10ma, but not strong enough to make it close at a 10-day low. These filters seem to fairly represent the current situation, and the results were quite compelling. Under these circumstances, it appears bounces have been both reliable and powerful. Yesterday’s move to new highs was accompanied by very strong breadth. The Up Volume % on the NYSE came in at 91%. It is fairly unusual to see such strong breadth occur when the market is hitting an intermediate-term high. 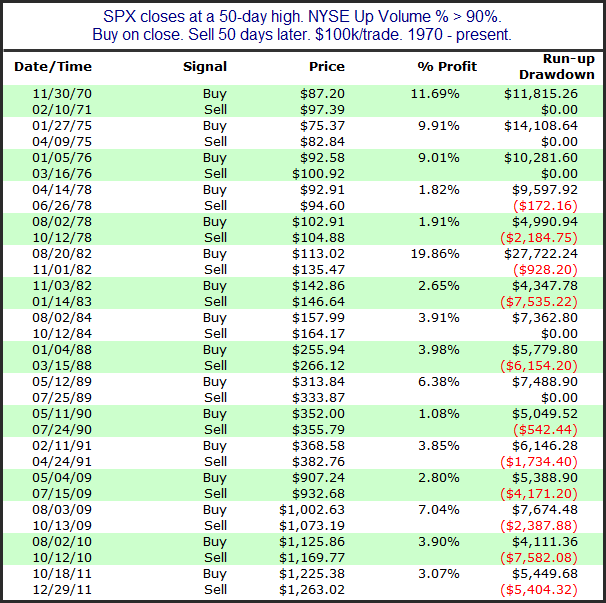 The results below show all non-overlapping instances of a 50-day SPX high with greater than 90% upside volume since 1970. These results are very compelling. 100% winners (16 for 16) and the average instance closed up 5.8% when looking out 50 days. This appears to be a nice piece of evidence for the bull case. The study below is one I mentioned on Twitter (http://twitter.com/qerob) yesterday. Often leading up to a Fed Day the VIX will rise as traders fret over what the Fed might say or do. 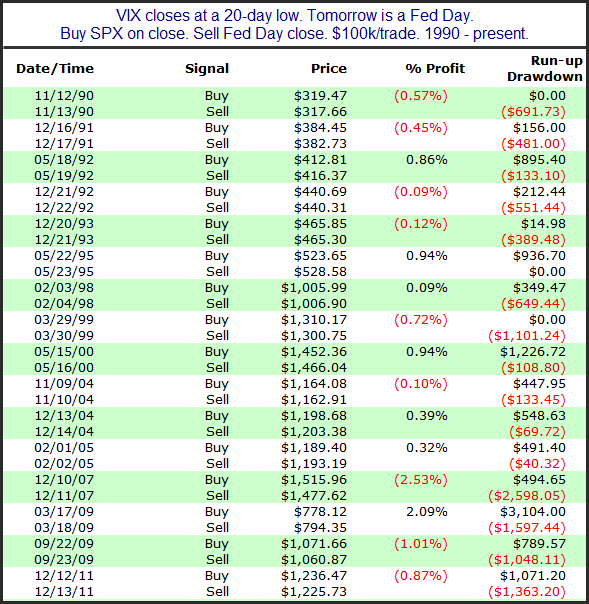 Monday was one of those rare occasions where VIX closed at an intermediate-term low on the day before a Fed Day. Below are results of the 16 other times this has occurred. The average trade posted a loss of 0.05% - nearly breakeven. And the average run-up and average drawdown were both close to 0.7%. We know Fed Days have provided an upside edge over the years, but when the VIX has closed at an intermediate-term low, no edge has been apparent. There is a possible seasonal influence that could have a bullish impact on the market this week. Op-ex week in general is pretty bullish. March, April, October, and December it has been especially so. S&P 500 options began trading in mid-1983. The table below is one I have showed on the blog the last couple of years in March. It goes back to 1984 and shows op-ex week performance broken down by month. All statistics are updated. Below is a study I showed in last night’s Subscriber Letter (click here for a free 1-week trial). It considered volume’s impact on a short-term oversold bounce. It also utilized a long-term trend filter. These results suggest there should be more upside to this bounce. Statistics across the board are impressive over the next week. But does the low volume really matter? To answer this I ran the same study below but flipped the volume requirement and insisted volume come in higher. Volume accompanying a move can signify enthusiasm for the direction of the move. Short-term oversold bounces sometimes remind me of junior high school girls. Back when I was in school, if you wanted a girl to like you then you had to make sure she didn't think you liked her. Showing any enthusiasm would scare them off quickly. You had to play it cool, man. It appears that is what the bounce did Wednesday - it played it cool, man. And now it's chances are better. 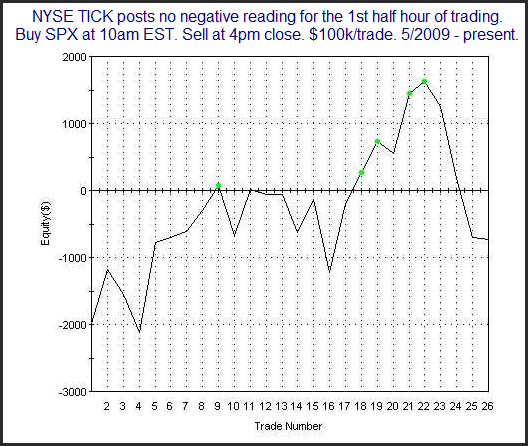 The study below considers the extremely low reading in the TICK TomOscillator. The TICK TomOscillator is an indicator that uses recent closing TICK values to determine buying and selling interest at the end of the day. It was developed by Tom McClellan. I’ve done some work with it and the name I use is one I made up. For those who would like to learn more about the TICK TomOscillator, the link below is a good place to start. The study below looks for an extremely low reading in conjunction with a short-term oversold price condition during a long-term uptrend. It has been shown in the subscriber letter before and triggered again at Tuesday’s close. There has been a strong propensity for the market to bounce over the next 2-3 days. 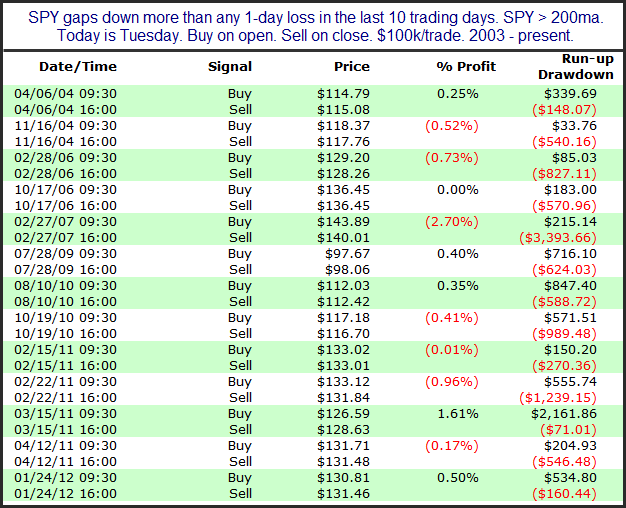 Look like the SPY is going to open down more than it has dropped any single day so far in 2012. This can be startling to market participants. Many may be caught flatfooted. Of course Tuesday is the #1 day to see a Turnaround. But does it apply when the market gets a shock at the open? I ran the test below to see. It does not appear Tuesday give us a hig probability play. Both Wednesday and Thursday of this week we saw very strong and persistent buying in the 1st half hour of trading. 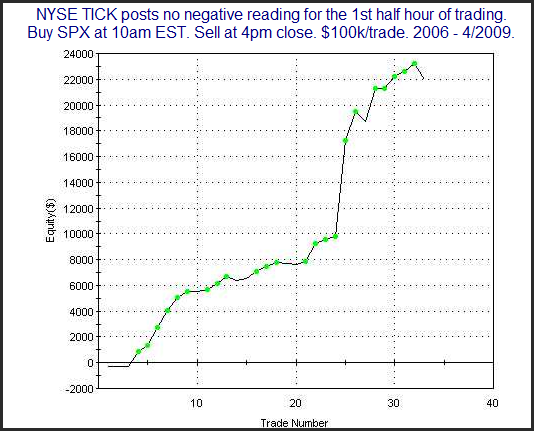 In fact, neither day saw a single negative TICK reading for the entire 1st 30 minutes. There was a time when this kind of buying would almost certainly create a pile-on situation and the market would continue to rally throughout the day, only ever pulling back moderately, and finishing the day near its highs. Dr. Brett Steenbarger, who used to write the excellent Traderfeed blog (and several books), often referred to these kind of days as “Trend Days”. He wrote several posts on them. He would say that the key to profiting from a Trend Day is to identify it early and then jump aboard. If you fight a Trend Day by trying to short the highs you will keep getting run over. Strong early TICK action was one clue that a Trend Day might be forming. But in recent years it has become very unreliable. Let’s look at some studies to see what I am saying. The study below shows how strong early TICK action (no negative TICK reading in 1st 30 minutes) suggested a strong upside edge for the rest of the day. The period studied is 2006 – 4/2009. Pretty awesome stats all around. Now let’s look at a profit curve. While that one trade in the middle gave an extra-large boost you can see that new highs were made continually throughout the curve. Overall, this appears to be a very appealing edge. But now let’s look at the period from May 2009 through the present. Same setup. Over the last 26 instances it appears there has been no discernable edge. Let’s see how the profit curve looked over this period. Very inconsistent. A few minor streaks. Not an appealing curve in the least. First the obvious: if you are an intraday trader and you look to play Trend Days, then you are hopefully aware before reading this that some of the old identifications tools are not working as well lately. Don’t get caught in reversals like those that occurred the last 2 days. For everyone – something changed that eliminated this edge. I don’t know what. It isn’t my job to know what changed. And I don’t care the reason. I’m only interested in being aware when it happens so that I can adjust my strategies. And no matter what your timeframe you must keep in mind that the market is always changing. Identifying those changes and adjusting to them is vital for long-term success as a trader. Traders don’t all need to quantify everything as I do. But identifying changes and understanding what is working and what is not is important. You must constantly adapt to stay in business. Early morning TICK strength is just one example of environmental change. The longer you trade the more examples you will see. So trade with an open mind. Take advantage of market behaviors while they last. When the market begins to behave in a different way, adapt. Stay in business. Did Wednesday's Reversal Bar Mark The Top? Wednesday’s action saw a new intraday high, an outside day, and a lower close, and it came after a closing high was made the day before. Engulfing reversal bars such as this are often viewed as bearish. I’ve looked at them a number of ways in the past. Below are updated results of one such study. Results here are similar to other studies I’ve run on outside day or key reversal bars. It is often followed by a few days of weakness but it rarely marks the kind of significant top it is renowned for. I also ran this study requiring longer-term highs (50 days instead of 10 for instance). This did not have a material impact on the results.